At SSLTC we have various adult and junior club nights throughout the week, in summer and winter. Have a look below and if considering joining, please come along and try us out for free! Adult club nights are every Wednesday starting at 18:30. A committee member will be on duty to organise the evening and for prospective members, to show them around and introduce them to playing partners. Sunday Mornings will run from 10am until lunch time and provide mixed social tennis for any full members who can simply turn up to play on the day. Currently this is a self organised roll-up with those in attendance organising members into pairs for doubles sets and the club providing free use of tennis balls. At both Wednesday and Sunday sessions the Air Dome will be used through the winter to ensure a dry game, at no extra cost to members. Do come down and give us a try a few times before you join. 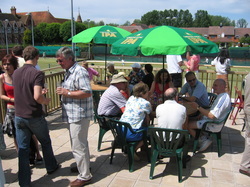 Both Wednesday and Sunday are social tennis although the emphasis is for Mixed Doubles. You are always encouraged to bring a bottle to add a little zip to your shots and aid the "social". Junior Club Nights are every Thursday throughout the year running from 5pm to 7pm. John Cavill has his coaching team on site to provide supervision and assistance for all those that attend. This is an excellent way to meet all the other Juniors and teenagers playing down at the club, play some social tennis and arrange your games for the rest of the week. A tuck shop will be available in the club house, to help keep up the energy levels of the youngsters using the courts and will be manned and supervised by parent members. If any parent would like to volunteer their time either on an occasional or regular basis ( for example when your children are playing on court), then please contact John Cavill. Further activities will also be made available in the club house to entertain our junior members once they have finished playing or while they are waiting to get on court. The coaching team organise little competitions that can count towards your rating points if you are keen to move up the rankings. There are ladder and box leagues for all age groups. Wednesday Club Mornings occur throughout the year from 10:00 to 13:00. This is a social mix in and there is a small charge for balls. If you would like to join these Wednesday sessions, please contact Phyllis Leete or Brian Berrill as this is a very popular event each week. Both indoor courts are booked for these sessions through the winter. Thursday Club Afternoons are another opportunity for social mixed tennis. People roll-up from 13:00 to about 15:30. Contact Phyllis Leete or Brian Berrill if you would like to join. Sunday Winter Club Mornings on a Sunday replace the Breakfast Club from late September through to early April each autumn. Informal Sunday mornings run through to Open Day in April when we switch back to the Breakfast Club, the first Sunday after Open Day. There are no committee members on duty, so please organise yourselves and switch around after a set. Wednesday club evenings, with a duty organiser, continue throughout the year. For all the above roll ups, the club provides the balls. Match practice through the summer is on Monday evenings from 6:30 for the Ladies and from 7pm on Thursday evenings for the Men. Contact respectively, the Club captains, Margaret Gurney (07801 680231) or Mark Meagrow (07484 853413). ...........fielding over 50 players on Thursday nights over the winter. Men's Partners League is now up and running for our XVIth (longer lived than Strictly but equally entertaining!) 2016-17 Winter season. If you wish to be involved in this current winter season contact Simon Burn to be added to the reserve list. Men's roll up practice is replaced every Thursday from Partners started on 13th October. The final results from Season XV below. Results of the current season with League Four results. Honours for League 4 go to the Teletubbies with the Championship being won by the Tot Shots by dint of one more main court win over the Stony Bagels. With 4 leagues complete, that is one Premiership title apiece for Iced Chillies, Teletubbies, Stony Bagels and Slice 'n Dice, but only the Bagels and the Chillies in the Premiership race for that last title and the bragging rights for the Tummy Bumpers Cup. This allows members to block book the same session(s) over a given period within the Air-dome at a discounted rate on the standard peak and off-peak rates. The advantage to members is that it give them a guarantee of tennis throughout the period of the booking. The advantage to the club is that it guarantees income. Period 1 – October 9th to 18th December – 10 weeks. Period 2 – January 1st to 11th February – 6 weeks. Period 3 – February 12th to 2nd April – 7 weeks. Any booking made shall be for the duration of each period. For Period 1 – Friday 22nd September. For Period 2 – Friday 8th December. The first application period will open one week before it closes. Subsequent applications can be submitted at any time. Members can apply for any combination of booking, 1 or 2 courts and any time but this remains the same for each week of the period in question. The Air-dome hire will be at a discounted rate of 10% on the new Air-dome hire rates of £8 peak and £5 off-peak. This equates to £7.20/hr and £4.5/hr. Once the application period closes the block booking will be approved and allocated. Where multiple applications for the same block of court time exists, then a ballot will take place. Once a block of court time is allocated, then payment must take place in full for the booking before each of the periods start. Once you have been allocated a ‘slot’, then you are given first refusal on the periods that follow, but you must formally apply again. Incumbents from the end of 2016-7 season will have first refusal for Period 1 2017-8. TO APPLY FOR A BLOCK BOOKING PLEASE EMAIL admin@ssltc.co.uk clearly stating your court, day and time requirements. Groups of members will need to allocate an individual to make the booking and payment. There are numerous other opportunities to play as part of semi organised groups on other evenings. Club members can introduce you to these as part of the new member induction process.